It has been nearly two weeks since my last post here. I think if this blog is really a house, it would be a house full of cobwebs. So, how’s thing going? Pretty well? Good then, I am happy to hear from you again ;). Lately I was being terribly busy with my jobs. It haunted me all day and night long, till I didn’t get proper time to sleep and got sick. But I am getting better right now. To make it related with the title, I’d like to share my experiences about my words that were granted by God. “So be careful what you wish for,cause you just might get it and not know what to do wit’ it. Cause it might just come back on you ten-fold” eminem. Sometimes me and my closest friends are making jokes by talking about people who stole our attentions and we called them “our living caffeine”. We don’t mean anything but adoring some parts of them that are used in a good way, such as their brilliant brain and inner beauty. In short, I ever said “What if God gives me 24 hours to be spent with the person?”, without thinking much. And voila, I had to spend my time in a day, since morning till evening with the person but not in a “nice way”. Maybe another day, I will say in specific sentences how the togetherness should be spent #gakapok. I also ever asked about a side job, so I can fill my time productively. And it happened, I got my wish until I couldn’t handle it and got sick. So, I said to my client that I can’t take the next job which has tight schedule because I was not in a possible way to continue the work. I’ve warned you, be careful then ;). But in other way, I’d like to make a conclusion that I am having fabulous days. My office things, my friends and my family are being nice to me. Last weekend I had dinner with two of my friends here, actually they are the close friends of my ex-senior in my previous company, and played bowling after that. My arms got hurt because of that, but I scored not bad and can show off to those guys :D.
Yesterday I watched Djarum Indonesia Open in Istora Senayan with Mbak Dina, Chocky, Pinkih and Mbak Umi. I had a first nice experience in watching badminton games live. When I need time to work, think, be alone, need free wi-fi, I can go to Anomali Coffee at the 2nd floor of Setia Budi One building. I can hang in there until 3 hours and drink delicious coffee. Mbak Dina brought me City Hunter files, so I can date Lee Min Ho again *dancing*. And today, after finished my work, I enjoyed my time with watching his handsomeness act. And let me introduce Ramon and Sebastian (again) to you. I know, some people have mocked me when I told them about my reason to bring Ramon home. I had hard times when I have to bring Mumble (my laptop) to office everyday. My shoulders and back got hurt and the “encok” thing is hard to find its cure. I felt back pain not less than three weeks. 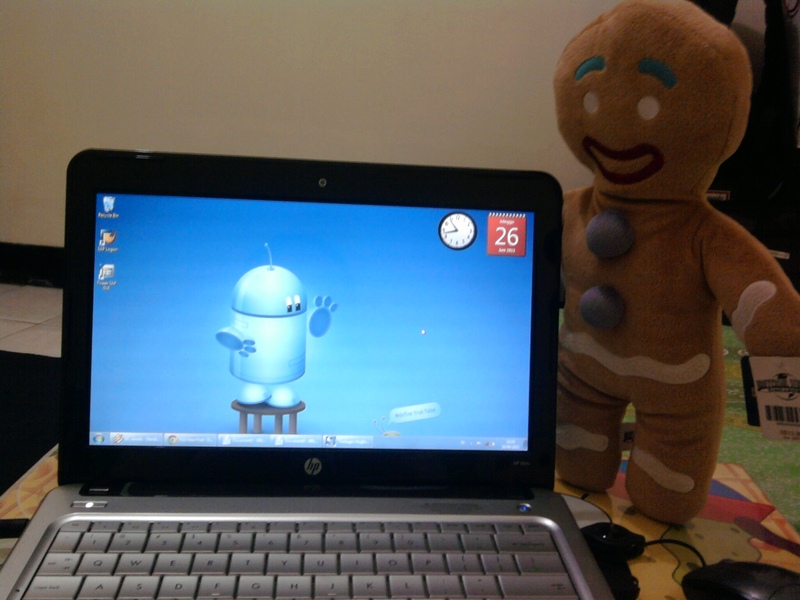 Besides that, I also said that “I allow my self to have a netbook when I can earn money from it”. Since Mumble have to sleepover in HP Service Center for several days and I believe with my current condition will make me able to earn money from my netbook, so I decided to bring Ramon home at 19th June. When people can have two or three hand phones, so why I can’t have laptop and netbook at the same time? #gregetan. And Sebastian? Can you say that he is not cute? He’s adorable :D. I bought him from Universal Studio. I think that’s all news I can share here. Hope you guys and gals have fabulous days too. Good night :*. mantep juga back pain yang diderita kalo pake laptop :D. Iya niih ah gile, kita g pernah ketemu. kamu kapan free? Buat apa toh laptop sm netbook 2 biji? Don’t you need only one?